Almost chickened out of going to the studio today seeing 2 inches of snow outside and plummeting temperatures. But I’d been looking forward to painting having been busy doing other stuff for much of the past week. So, quilted overalls on (of which my hubby is very jealous) and calor gas heater going full blast I actually had an enjoyable few hours working on 3 small pieces on paper I’d started last week. When fingers got a bit frosty I blasted them with the hairdryer I use for drying off acrylics. These three works continue the series I’m currently developing in response to coastal erosion on the North Norfolk coast (mainly around Happisburgh), which I wrote about in my previous post. 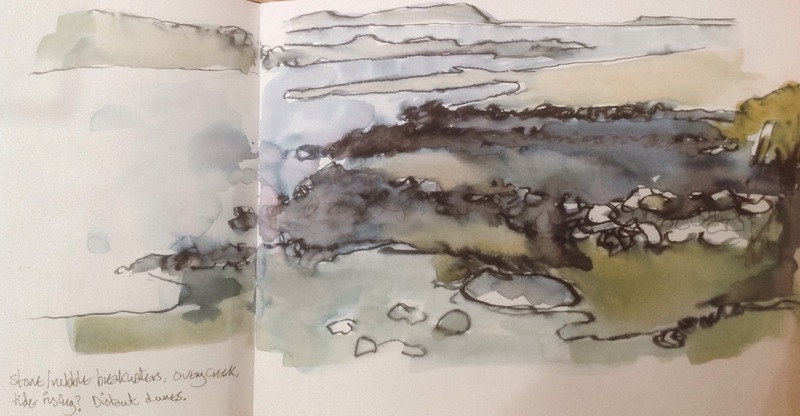 I’m attracted to the colours of the crumbling cliffs and broken structures littering the shore – ochre clay, pale stones, rusting metal, concrete etc, set against the shadowy land slips below the fields above. For these small paintings I used acrylics, gouache and inktense pencil on watercolour paper – I sometimes use a smoother paper or board support, but here I like the grain exposed by the dryish edge of the dragged paint. My solo exhibition, from 24th March for one month at the Grapevine Gallery, Burnham Market, North Norfolk, will feature these three works alongside other larger pieces in the series and several new reedbeds paintings. Below are a few of the earlier stages of these small paintings. 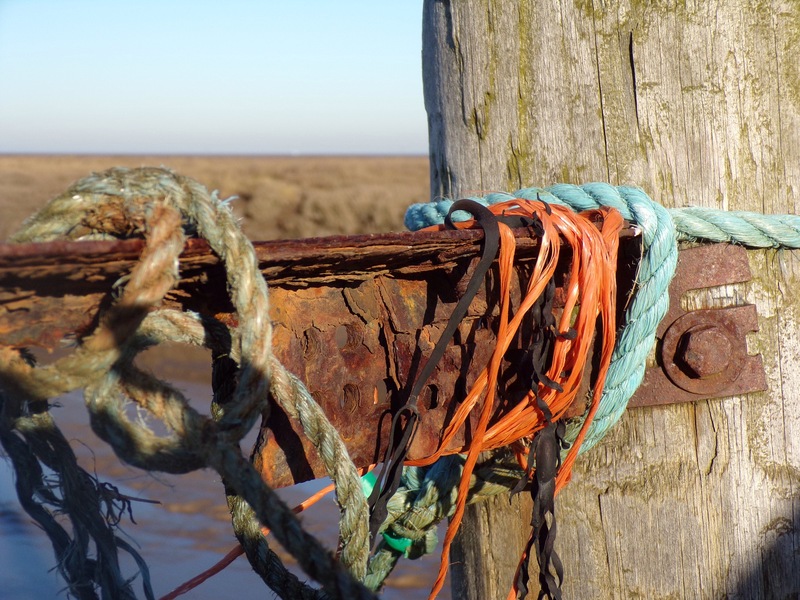 I read in an anthology this week, one author’s opinion that saltmarshes are one of the bleakest places in winter. Well, although they can be perceived like that in very poor weather, on a jewel of a day like the ones I experienced this week, they can be surprisingly beautiful. 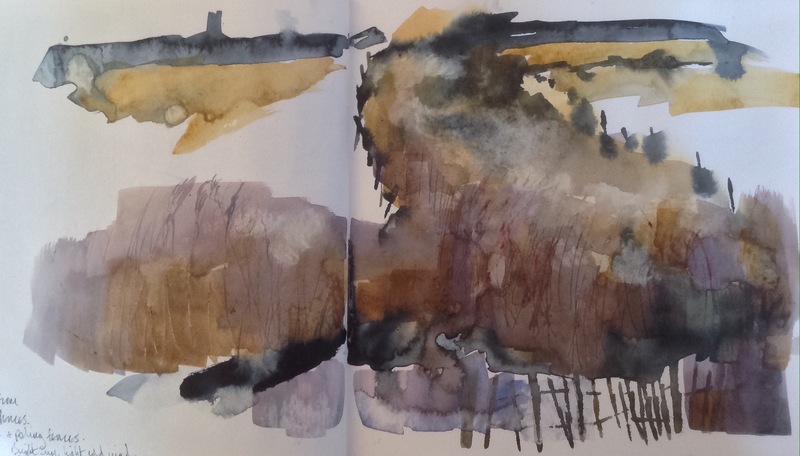 This sketching trip was to one of my usual haunts, Thornham on the north Norfolk coast. It was too cold to sit about for long but I got a couple of rough watercolours done. Sat by the coal barn sketching the small boats on the creek against the sun, I was almost blinded. 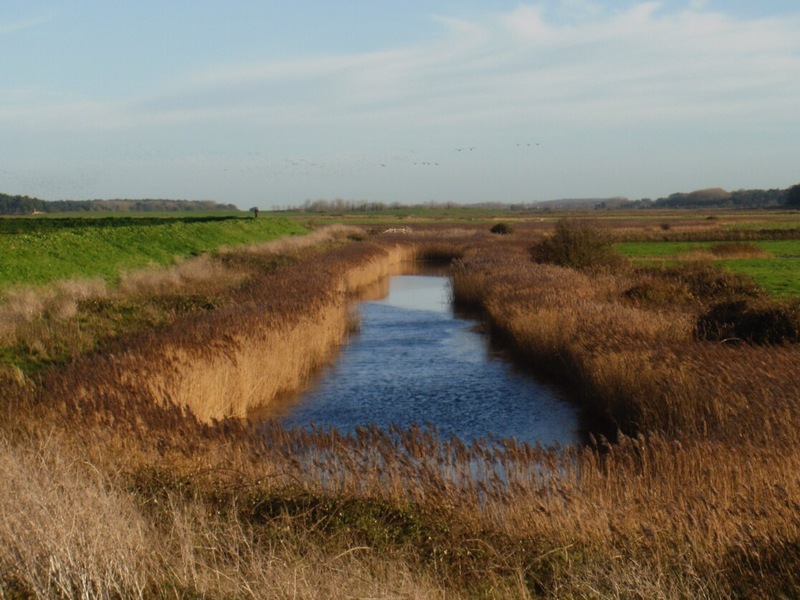 Reedbeds are an important part of the ecology on this coast, as with many such places in Britain. Their soft pewter feathered seedheads ripple like an inland sea. The stems are pale burnished gold in the winter sun and I find them hypnotic. I keep coming back to them recently, both physically, mentally and in my work. The other motif that keeps catching my eye, are the cradled pools and creeks of azure blue – reflecting the sky but much deeper in colour. They sit like brooches on the bronze brocade of the marsh. I feel the stirrings of an abstracted response to these with simple layered colour and texture. I don’t actually walk across the marshes themselves; unless you’re extremely familiar with them that could be pretty risky. 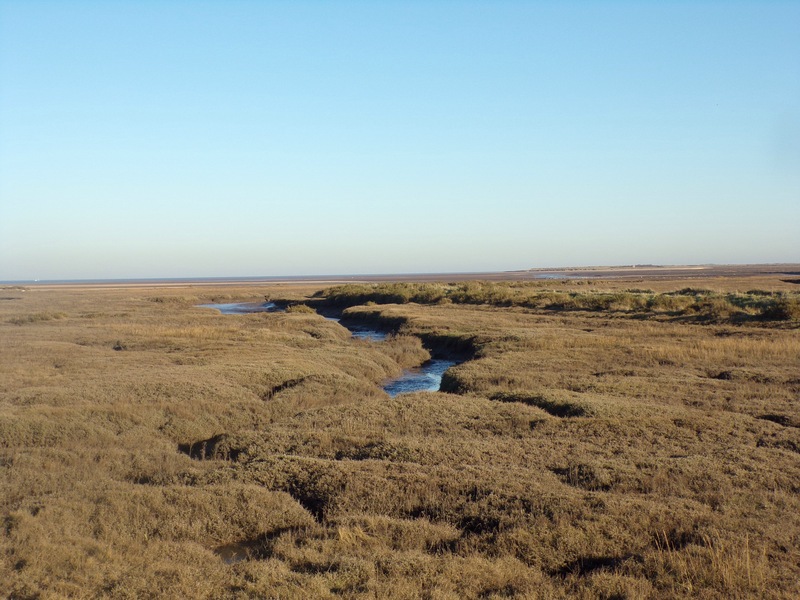 But the raised grassy banks of the sea defences that traverse the Norfolk saltmarsh coast, provide convenient access and elevated views across the marshes, reedbeds and creeks and out to the dunes and beaches. 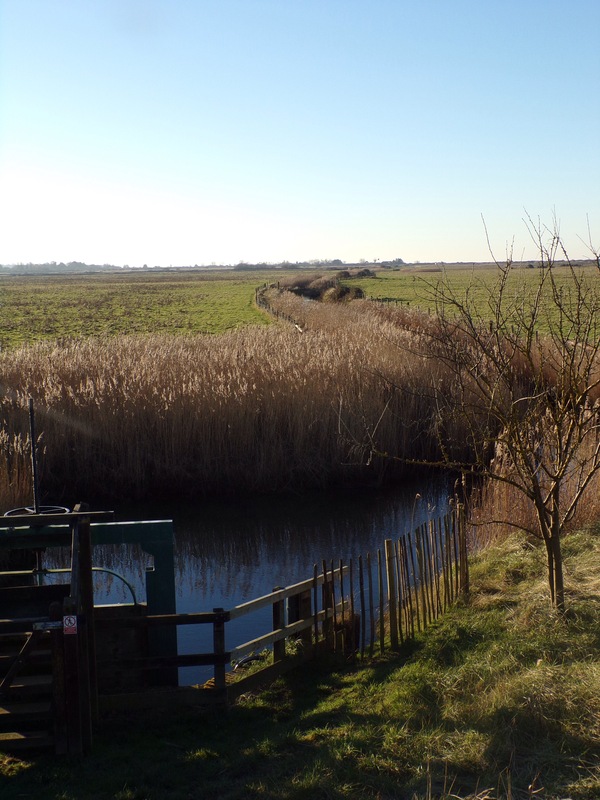 They also provide excellent walking opportunities; topped with good paths, they stretch for miles, crisscrossing the marshes between the string of coastal villages and, in places, linking up with official walking routes, such as the Peddars Way and the Norfolk Coastal Path. In summer the sea defences are bordered with a profusion of wildflowers, framing endless views. Even on the wildest winter days, there are usually a few hardy dog walkers or bird watchers about. Nevertheless it is still possible to get a sense of isolation and wilderness. 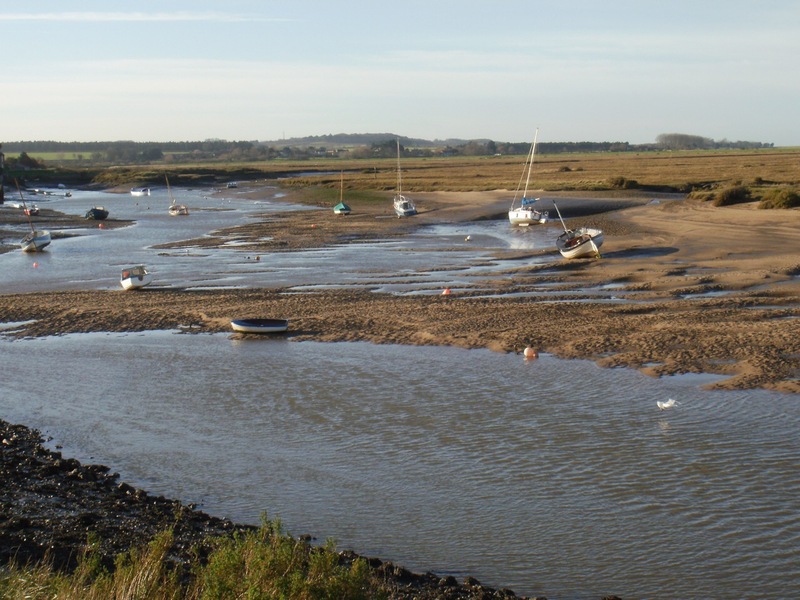 Thornham and Holkham are my usual sketching areas, but I sometimes go a few miles further east to Burnham Overy Staithe, which, with its moored sailboats, breakwaters, extensive sandy flats and grazings, offers an alternative sketching location. 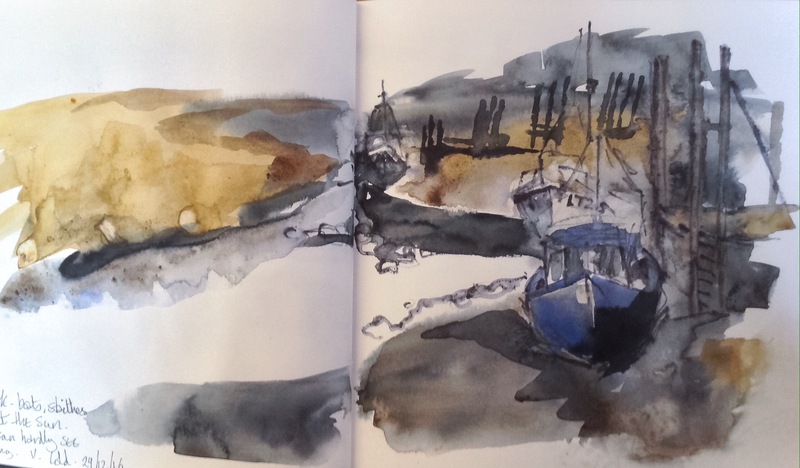 Last Wednesday, although cold and windy, was bright and sunny and not wanting to waste the rare winter sun, I threw my sketching gear in the car with a simple packed lunch, and headed up through Burnham Market, through the lovely village of Burnham Overy and out to the Staithe and creek. The tide was low and retreating, the wind strong and cold, and the clear sky reflected back off the wet mudflats where the creek had emptied, turning them into a blue expanse, scribbled with the tracks of birds and sinuous rivulets of water. 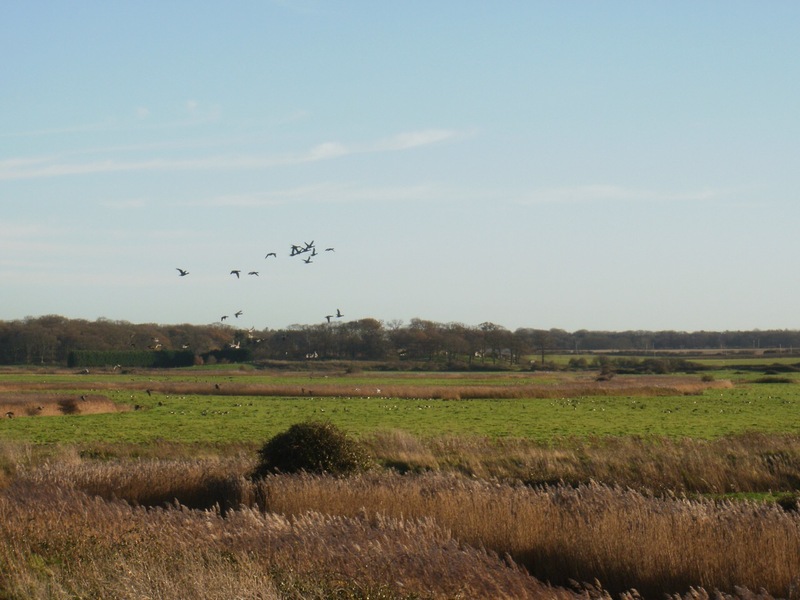 Large flocks of small dark Brent geese, with their distinctive mutterings, clustered on the winter grazings. Curlews called and the wind brushed the burnished silver reeds into undulating waves. Out on the retreating creeks, redshank and cormorant. In the distance, murmurations of starlings like shadowy twisting veils.